I drew this before my colored sketch of Diana Ross. I made the girl’s eyes look subtle than the original picture. Sharbat Gula (Pashto: شربت ګله, literally “Flower Sherbet”) (Sharbat is pronounced [ˈʃaɾbat]) (born ca. 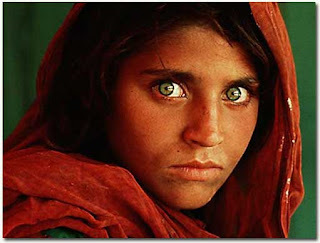 1972) is an Afghan woman who was the subject of a famous photograph by journalist Steve McCurry. Gula was living in a refugee camp in Peshawar, Pakistan during the time of the Soviet occupation of Afghanistan when she was photographed. The image brought her recognition when it was featured on the cover of the June 1985 issue of National Geographic Magazine, at a time when she was approximately 12 years old. Gula was known throughout the world simply as the Afghan Girl until she was formally identified in early 2002. 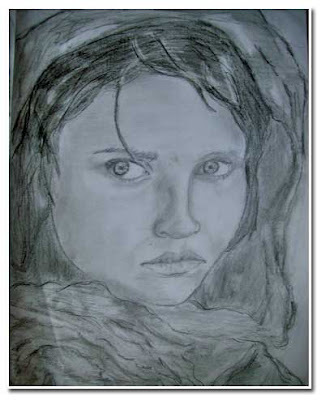 This entry was posted in Uncategorized and tagged Afghan girl, girl from Afghanistan on August 10, 2010 by Yami.